I was reminded of Jason Griffiths’ Manifest Destiny: A Guide to the Essential Indifference of American Suburban Housing during a conversation yesterday at Peter & Sally Nencini’s lovely stitching workshop at The Tetley. I haven’t pulled it down from the shelf in a while, but should revisit it. The book is particularly interesting having grown up in American suburbia. It is very hard to gain perspective on your “native” culture until you’ve gained a little distance from it, and I suspect I may have had a very different reaction to the book had I encountered it earlier. I don’t think my reaction would have been negative since Griffiths is very sensitive about his subject, but nevertheless it’s easy to be touchy when someone is analysing an aspect of your culture. The subtitle of the book is not something that trips off the tongue easily, even though I’ve said it numerous times. After it was published I wondered why the hell I had named it in such a verbose way. But if there’s any recompense in it, the title – like the subject matter – is rhetorical. That sense that you get with the suburban house, and the way that it’s marketed today that we’re trying to be persuaded of the value of something beyond our requirements, something rhetorical, something over-insistent. Too many words in the title, and the house itself too large. I also quite like Griffiths’ description of his book as his “obsession with an obsession”. The book was published by AA Publications and designed by the very talented Claire McManus. 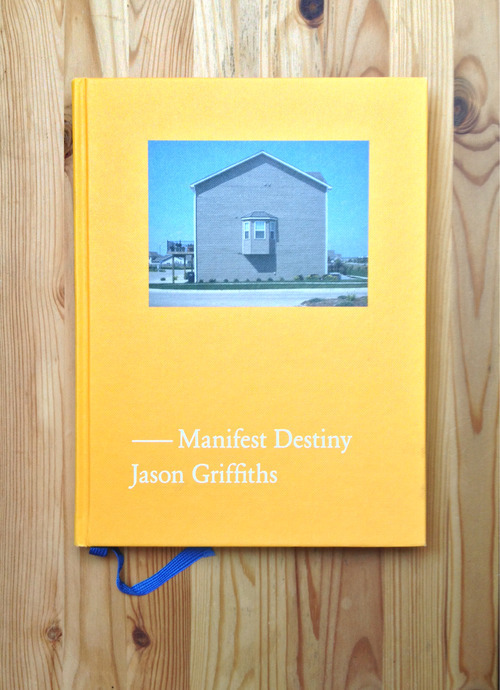 Manifest Destiny doesn’t seem to be available for purchase online at the moment, but I’d bet that the AA bookshop in London may have a few copies available.